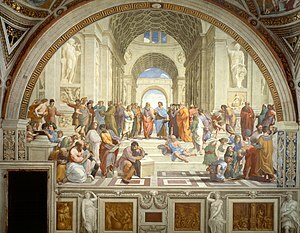 The Schuil o Athens, or Scuola di Atene in Italian, is ane o the maist famous frescoes bi the Italian Renaissance airtist Raphael. The parenthetical names are the contemporary characters frae whom Raphael is thocht tae hae drawn his likenesses. ↑ Raphael haes reuised the motif o twa weemen frae his earlier wirk the Veesion o a Knight. Raphaël, page 215, Edition 31; Edition 42 of Chefs-d'oeuvre de l'art: Grands peintres, Taylor & Francis, 1966. ↑ Accordin tae Rudy d'Alembert (see Rudi Mathematici (in Italian), Unwin & Carline, 2009), Raphael portrayed Hypatia gin her the face o the fifteen years auld Francesco Maria della Rovere, tae hide her true identity. ↑ The interpretation o this figur as Sodoma mey be in error, as Sodoma wis 33 at the time o painting, while Raphael's teacher, Perugino, wis a renained painter an aged aboot 60 at the time o this painting, consistent wi the image. Timoteo Viti is anither plausible candidate. This page wis last eeditit on 15 Februar 2018, at 20:29.